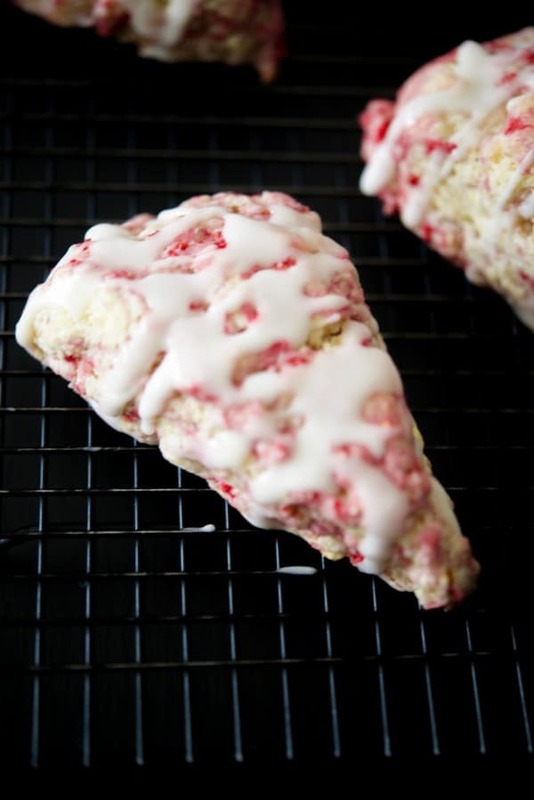 Raspberry Lemon Cream Cheese Scones made with fresh raspberries, lemon zest and cream cheese; then topped with a lemony sugar glaze are deliciously moist. Perfect for breakfast or an afternoon snack! 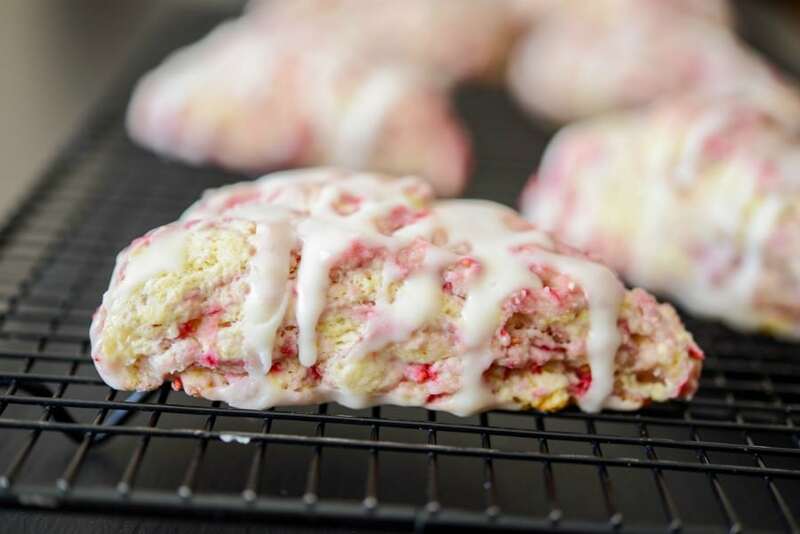 I’m fairly new to making scones, but once you have a basic recipe you can tweak it a bit to make other flavor combinations like I did with these Raspberry Lemon Cream Cheese Scones. I just love the flavor of raspberries and lemon combined together and haven’t made anything with this flavor since the ricotta cake a while back. Now that it’s officially Spring (and snowing as I type this yet again! ), I couldn’t wait to share these little rays of sunshine. Scones are very easy to make and I’m not sure why I ever waited so long to make them. For this recipe, you’ll need flour, sugar, baking powder, lemon zest, cold butter, cream cheese, egg, heavy cream and raspberries. I also added a lemony glaze to the top of them, but that’s totally optional. Start by mixing the dry ingredients and the lemon zest together in a large bowl. Next, cut the butter and cream cheese into small pieces; then cut it into the dry ingredients using a pastry blender. If you do not have one of those, two butter knives work too by criss crossing them in a cutting motion. Next, add a whisked egg and heavy cream; then mix with a spoon until blended; then carefully fold in the raspberries. I used fresh and they all broke apart which was fine, but if you prefer having whole raspberries in your scones I would recommend using frozen instead. They may keep their shape better. Finally, place the dough on a floured surface and shape into an 8-inch round circle. The dough will be wet so you will have to add a bit of flour to the top as well to stop from sticking. Cut the circle into 8 wedges; then place on a parchment lined baking sheet in a 350 degree F oven for 20 minutes (or until the bottoms are light brown). 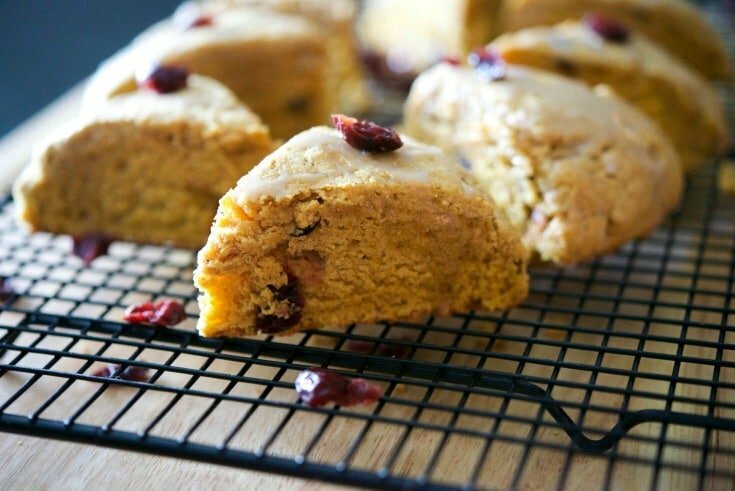 Remove the scones from the oven and allow to cool completely on a cooling rack. If you would like to make a glaze to go on top, combine 1 cup of confectioners sugar with 2 tablespoons of heavy cream and 2 tablespoons of lemon juice; then using a spoon, gently drizzle the glaze on top of the scones. They’re ready to eat once the glaze has set. 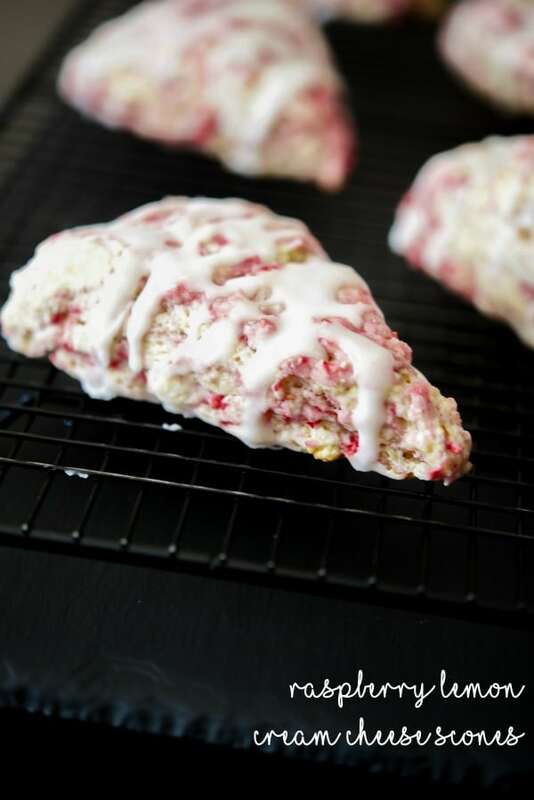 These Raspberry Lemon Cream Cheese Scones are so light and refreshing, and deliciously moist…even for a scone. 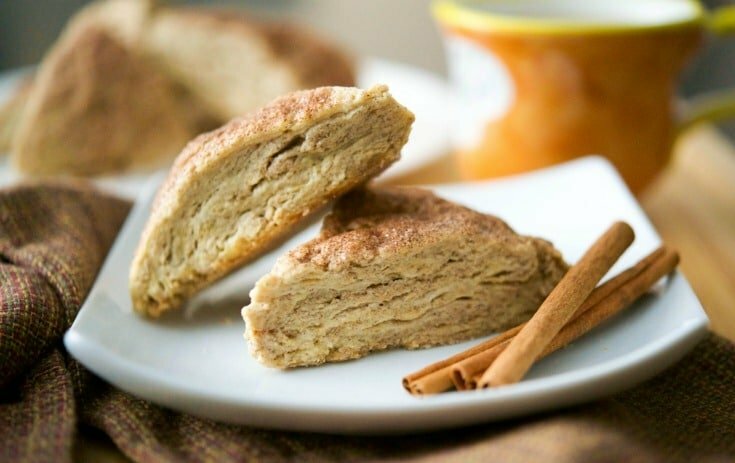 They make the perfect on-the-go breakfast or as a snack with a cup of tea or coffee. ~Enjoy! 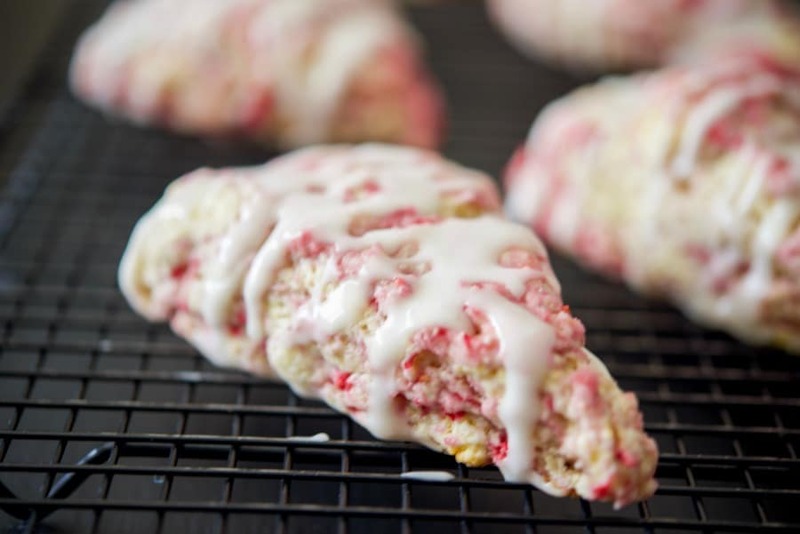 Raspberry Lemon Cream Cheese Scones made with fresh raspberries, lemon zest and cream cheese; then topped with a lemony sugar glaze are deliciously moist. Combine the dry ingredients and the lemon zest together in a large bowl. Next, add the egg and heavy cream; then mix with a spoon until blended; then carefully fold in the raspberries. Place the dough on a floured board and shape into an 8-inch round circle. (The dough will be wet so you will have to add a bit of flour to the top as well to stop from sticking.) Cut the circle into 8 wedges; then place on a parchment lined baking sheet; then bake for 20 minutes (or until the bottoms are light brown). 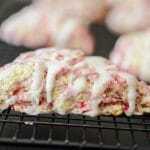 Remove the scones from the oven and allow to cool completely on a wire rack. Combine the confectioners sugar, heavy cream and lemon juice and mix until smooth. Using a spoon, gently drizzle the glaze on top of the scones.